A passionate and dedicated athlete, Mark has earned the awe and respect of cycling enthusiasts and professionals. He has received hundreds of letters from fans nationwide, with comments like: “‘I want to be like you when I grow up!’ ‘Thanks for slowing your pace to wait for us!’, and ‘I think of what I’ve done, and I think it was quite an accomplishment; but when I look at what you did, it puts me to shame.” We can only imagine the number of people he has inspired and, through his own example, challenged to greater accomplishments than they previously considered possible. Mark’s zest for life has propelled him (and his bicycle) all over the country – from Portland to San Francisco, from Minneapolis to the Gulf of Mexico, across Florida… the list seems to grow with no end in sight. From the moment he retired as a commercial crab fisherman and borrowed his wife’s bike at age 62, Mark’s been hooked. And it shows. He rides a minimum 50 miles every day. That’s right – 50 miles. He refers to his bike as his doctor, his pharmacist and his fountain of youth. Recognizing that age is only a number, Mark offers himself as proof that life can begin after 70. 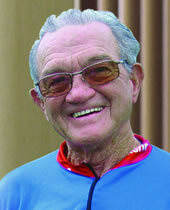 To celebrate his 76th birthday next year, he plans to ride his bike from Maine to Florida. Mark loves every blessed inch of the roads he travels and cherishes the thought that he is motivating others toward healthier, happier lives. Mark Oncale… Tenet Choices Champion.